It is the rare child who does not fight and argue in the car every now and then. There are many ways of dealing with bickering children while in route to somewhere. Handing the most responsible child five pounds of candy to dole out for the purpose of keeping everyone in the back seat quiet is not the wisest move. Neither is turning around in the front seat and slapping each child in a long horizontal wap. Safety must come first. Children accustomed to wearing seat-belts from infancy are unlikely to fuss over the need to wear them. Just make sure that it is a carved-in-stone rule. If anyone in the car is acting in such a way that he may hurt himself or others, pull over and stop the car. Decide whether to continue after all is settled down or turn around and go back home. If a parent says, “I mean it. If you don’t stop we’re going back home.” and the children continue to raise a ruckus, the parent must turn around and return home. Otherwise the children will learn they do not have to pay attention to the parents’ requests. Follow through is a must, so if you are on a long distance trip to see family or are on vacation the “go back home” statement will not work and you’ll have to change tactics—perhaps find a place to park the car and not start driving again until all are quiet. The best way to prevent backseat bickering is to keep the children happily occupied. Consider putting them to work. 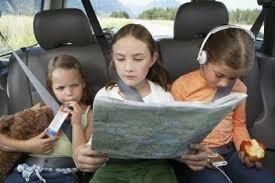 If a child is one who always asks, “Are we there yet?” give that child the job of navigator. Before the trip begins, bring out the road atlas and check Yahoo® and Google® maps. Not only are you keeping the child busy, you are providing fantastic, practical life skills in math and geography. If more than one child is interested in being the navigator, give each a section of road to help keep the family going in the correct direction. No one likes being in the middle seat the whole way for a long trip. Try rotating seats on a schedule. Flip a coin to see who gets to sit in the front seat with the driver first. Fairness is an enormous issue with children. There is less arguing if the rules are the same for everyone. Have the children help decide potential punishment for poor car behavior. Children are more likely to follow the rules they have helped make. Reward good car behavior with something non-food related. If your family has a movie night, the children may choose a movie out of several previously chosen by the parents.